I originally planned to post all the tales in the order they occurred, but sometimes I’m gonna have to go with the Flow … this morning, I got a new comment on the post about Binny the Albino Squirrel, noting the similarity between my experience and the story of the Little Prince & the Fox. When she put it aside to go to sleep, I picked it up and paged through, wondering if it would seem terribly cheesy to my older eyes. I flipped through looking at chapter titles until I saw one called ‘On Becoming You,’ and started at the beginning of it. A quote from the first page stood out to me, “Perhaps love is the process of my leading you gently back to yourself.” The quote was from the book ‘Wind, Sand, and Stars’ by Antoine de Saint Exupery – a name that rang a bell – years ago, my grandmother had given me a copy of Exupery’s ‘The Little Prince,’ saying that I had always reminded her of the story. 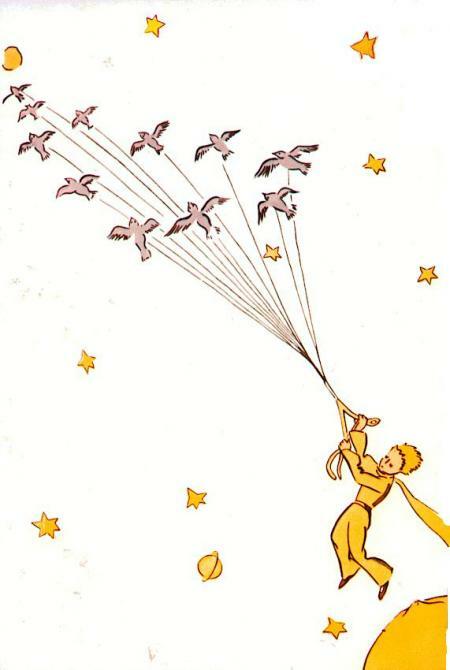 I had an impulse to find that copy of ‘The Little Prince,’ which I thought was in the bedside table drawer – I startled Becky with the burst of activity as I dug around looking for it. But I didn’t find it in the drawer, and went to sleep thinking I’d locate it later. 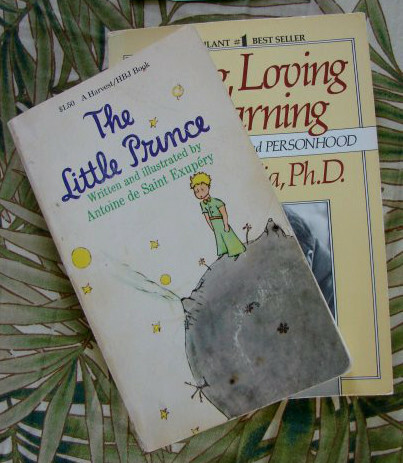 But by morning, I’d forgotten about finding the Little Prince. I laughed at the coincidence and told her I had just been looking for that very book the night before, and I went upstairs to find it (it was ON the bedside table, not in it). Then I asked her what had prompted her to write the note. A different chapter of the very same book that Becky and I had been reading – Leo Buscaglia’s ‘Living, Loving, & Learning’. “You can see clearly only with your heart. Not only that, but the title rhymes! The Little Price is an awesome book, so much packed into such a small volume. Yeah, I am a sucker for the rhyme, which is the only reason I titled it as a ‘coincidence’ and not a ‘synchronicity’ – it does feel meaningful to me. I am so enjoying your blog. I loved the Binny story because I both laughed and I cried. Perhaps the fact that Binny was so enchanting is what made the story so sad. Despite the sad ending, Binny really made me smile, because I think, in way,………Binny is you! Full of curiosity, play, innocence, and light. Thanks for making me smile though my tears. Are you familiar with Robert Moss’s book ‘The Three Only Things’? It’s about dreams, coincidence and imagination. I found it very informative. Chip – yeah, that’s an amazing spot, isn’t it? One of my favorite places in earth. I haven’t heard of that book before, I’ll keep an eye out for it, thanks! The Little Prince is one of my all-time favourite books and i still treasure the copy i’ve had for 40 years. The part about the little prince and the fox inspired me greatly when i was working as a remedial teacher with a very disturbed mute young girl, who regained the ability and desire to communicate. Another favourite of mine is The Velveteen Rabbit. Have you read it? I also love Leo Buscaglia, a wise man indeed, with a huge heart.